Peptide (C)HEHVDRYVPHREHNHRE, corresponding to amino acid residues 571-587 of rat CACNB2 (Accession Q8VGC3). Intracellular, C-terminus. Homology Mouse - identical; human - 11/17 amino acid residues identical. Label ATTO-594. Maximum absorption 601 nm; Maximum fluorescence 627 nm. The fluorescence is excited most efficiently in the 580 – 615 nm range. This label belongs to the class of Rhodamine dyes and can be used with fluorescent equipment typically optimized to detect Texas Red and Alexa-594. Standard quality control of each lot Western blot analysis (unlabeled antibody, #ACC-105), and immunohistochemistry (labeled antibody). Immunohistochemical staining of rat hippocampus using Anti-CACNB2-ATTO-594 Antibody (#ACC-105-AR). 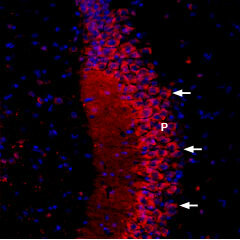 CaVβ2 staining (red) appears in CA3 pyramidal layer (arrows). Nuclei are stained using DAPI (blue). Qin, N. et al. (2002) Mol. Pharmacol. 62, 485. De Jongh, K.S. et al. (1990) J. Biol. Chem. 265, 14738. Pichler, M. et al. (1997) J. Biol. Chem. 272, 13877. Yamada, Y. et al. (2001) J. Biol. Chem. 276, 47163. Voltage-dependent Ca2+ channels are a family of membrane proteins that allow cells to couple electrical activity to intracellular Ca2+ signaling1. Voltage-gated Ca2+ channels are classified as T, L, N, P, Q and R, and are distinguished by their sensitivity to pharmacological blocks, single-channel conductance kinetics, and voltage-dependence. On the basis of their voltage activation properties, voltage-gated Ca2+ subtypes can be further divided into two broad groups: the low (T-type) and high (L, N, P, Q and R-type) threshold-activated channels2. The activity of the channel pore is modulated by 4 tightly-coupled subunits: an intracellular β subunit; a transmembrane γ subunit; and a disulphide-linked complex of α2 and δ subunits3. There are four distinct β subunits: β1, β2, β3 and β44. There are 4 splice variants of the β2 subunit: β2a, β2b, β2c and β2d. β2a and β2b are expressed in heart, aorta and brain, and are 606- and 632-residue proteins, respectively. β2c and β2d (655 and 604 residues, respectively) are expressed in brain, and studies show beta-2c to be also expressed in heart. All splice variants differ in their N-terminal regions5. Check out more of our new products. Anti-CACNB2 Antibody (#ACC-105) is a highly specific antibody directed against an epitope of rat CaVβ2. The antibody can be used in western blot analysis. It has been designed to recognize CaVβ2 from rat, mouse, and human samples. Anti-CACNB2-ATTO-594 Antibody (#ACC-105-AR) is directly labeled with an ATTO-594 fluorescent dye. ATTO dyes are characterized by strong absorption (high extinction coefficient), high fluorescence quantum yield, and high photo-stability. The ATTO-594 fluorescent label belongs to the class of Rhodamine dyes and can be used with fluorescent equipment typically optimized to detect Texas Red and Alexa-594. Anti-CACNB2-ATTO-594 Antibody is specially suited for experiments requiring simultaneous labeling of different markers. Anti-CACNB2 Antibody (#ACC-105), (for western blot analysis).